A fine delicacy form Kashmir which derives its name from red Kashmiri Chillies and literally means Red lamb. In a bowl mix mutton with curd and little salt, and keep aside. Heat oil in a pan and put whole garam masala, when they start to crackle, put chopped onions anf fry till golden brown. Add ginger-garlic paste and fry again for two minutes. Add all the masala powder and fry till oil comes up. Now add mutton with marinade and stir fry on a high flame for 2 minutes. Now add water and lttle salt and cook with closed lid till meat is tender and gravy is medium thick in consistancy. Keep in mind that, we have already put salt while marinating the mutton, so adjust the seasoning accordingly. Now add cream and stir well and cook for another 3 minutes. Serve with Rice, pulao or roti if you like. @ jean chaurasia.................I know it now.........but thanks anyway for liking it. Harsh, your recipe is good, but its just a glorified mutton curry and not 'rogan josh'. My apology to all. With my increasing knowledge about food, I feel my recipe is NOT A AUTHENTIC. 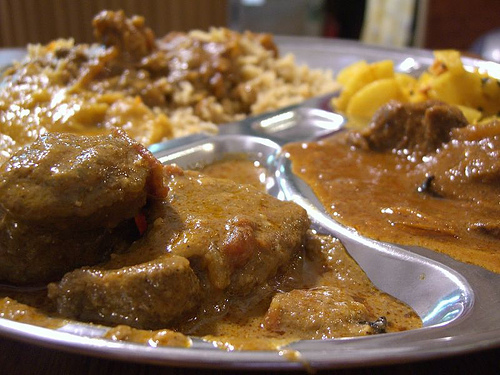 This recipe is another mutton curry but not Rogan Josh. Why isn't rattanjog mentioned in the among the ingredients? the recipe has a very thin gravy and cream no way.. The recepie is no where near the authentin Rogan Josh. Rogan josh is flavoured with 'Ratan jote' which is a dry bark of a tree found in Kashmir Valley which gives it the color along with Kashmiri Chillies and saffron. Cream no way!!!! I cooked the Mutton Rogan Josh without adding the white cream. I also used half the amount of garlic and ginger paste suggested in the recipe. I don't care whether Harsh was being authentic or not. The result was astounding. Thanks Harsh! Keep it Up! I agree with you Mr Dasgupta, that my recipe is truely authentic Rogan Josh as cooked in kashmiri kichenss Because this dish is very hot due to excess use of red chillies and ginder powder, to make it palatable to people other than from kashmir, I have tried to make it le ss hot and pungent. That is the reason I have added cream in it.